What was happening? AGAM was coming to perform for a charity cause! I was going to be attending a concert after ages, the last one being Bryan Adams in Blore!! Jagadish Natarajan (rhythm guitar). The only change in the band has been that Jagadish’s replaced Suraj Satheesh as the rhythm guitarist last year. The very 1st time I heard these guys was on Coke studio and then came Madras Market performance. 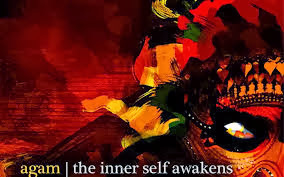 Subsequently I did listen to quite a few of their pieces thanks to YouTube and then went ahead and purchased their album - The Inner Self awakens.. From thereon, there has been no turning back! Infact, I also fell in love with their version of Aromale and Dil se re as well..
Ok, now that you know who Agam is, let us get back to the concert.. On Saturday, friends came over picked me up around 6pm and we reached the venue at 6.10 pm. The place looked pretty deserted, we had a small doubt if the concert was indeed happening that particular evening. There were no banners, no posters, nothing. It was complete silence. I was back in Kamaraj Arangam after nearly 15yrs!! Walked into the hall, collected our tickets and waited around for the hall to open. In the background, we could hear the band doing sound checks and last minute practice. We were happy listening to them from the distance. And then, around 6.30, the doors opened and we found seats, making sure the cameras were not in our path. Soon people started filing in, but it wasn't as much as we expected. We were quite upset and sad to see the hall sparsely full, but then we decided to focus on the band and enjoy the music. The show started around 7.45 and it was absolutely mind blowing. The instruments came to life and then Harish started singing, and that was it...What a voice he had and then for another song he also played the violin... Let us not forget the amazing guys on guitar and drums and the piano. We were lost to the world. We enjoyed every piece, every second of the evening. We were happily singing away, clapping and grooving to the beats.. The band took a break from their songs and belted out Aromale which got the crowd going, and then came Dil Se which was again a big hit with the crowd. They also sang a new composition and few that is found on their soundcloud stream. If you love these guys, and want to watch them live, make sure to mark Oct 18th in your calendar and be there at Havana, Raintree... And follow them on facebook to know more! !